Corporate governance. Capital Requirements. Information Security. Identifying and measuring potential risks help you connect the dots to create a sound ERM program for your organization. In today’s environment of security regulations and requirements, organizations must take a comprehensive approach to ERM to identify and mitigate potential threats. Risk is cumulative, and unidentified weaknesses can quickly spiral out of control, resulting in costly solutions that can lead to reputational damage. The first step in designing a sound ERM program is to understand which components are needed and how to implement them. 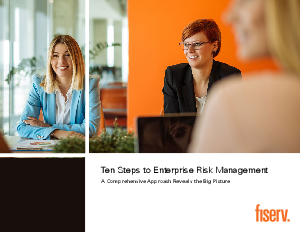 Ten Steps to Enterprise Risk Management: A Comprehensive Approach Reveals the Big Picture, provides a straight-forward approach to creating a reliable, yet flexible program to address existing threats with the ability to adapt to emerging ones. In the end risk management is everybody’s job – do you have a plan in place to help your employees manage unpredictable threats and known weaknesses?